I’ve just come out of the faintly out-of-body experience of listening to one man conduct two movements of Vivaldi’s Four Seasons as lead violinist and follow that by singing countertenor in a Vivaldi cantata. All very capable and professionally earnest, but you do have to wonder why. 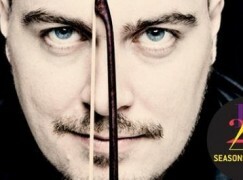 Why Dmitry Sinkovsky does it, and why he’s unable to choose between very different musical paths. The album s out shortly on the naive label. Aptly named, for once. Why not? Because it is unusual, because it is a path less travelled? Because in this industry we are expected to fit into narrow pigeon holes that still smell of its previous occupant? Singers are expected to sound identical and be interchangeable to their Fach. This makes life easy for the theaters, but not for the Artists. The artist should be the master of his destiny, not follow prescriptions or expectations of conservative-minded outsiders. Cellist? Singer? Both? NO WAY! My singing informs my playing, meaning, although I cannot practice 8 hours a day like my dad, my phrasing and musical ideas always come from the use of the voice and the knowledge and instinct of singing technique. I will choose bowings and fingerings based on how I would sing the phrase, likewise, the excellent and meticulous musical grounding learning a stringed instrument gives one, means my singing life is much easier, I learn music quickly, I enjoy interplay with orchestras, having played in one for a long time, and can approach Lieder and collaboration with pianists in the same way I do as a chamber musician, relishing the component and inspiration of the poetry as a singer, whilst enjoying subtleties of color and phrasing from the standpoint of a cellist. My show ‘The Singing Cellist’ (www.singingcellist.com) is one of a kind and I get invited to perform all over the world combining lieder, song, sonata and works for voice and cello combined. Something unique in a saturated world of excellence is essential to making a living. So why would I deny one or the other? Don’t ask permission, just do it! I was so happy when I stopped asking for permission. Far from being encouraged to focus on one instrument, young musicians should be inspired to be polyglots. I feel we are entering a phase of a new renaissance, where musicians compose, play several instruments, sing, teach, perform in various ensembles and as soloists, write pop songs, play early music even conduct (when absolutely necessary). Each discipline informs and broadens the next. We should celebrate versatility, not criticise it, especially as in Sinkowsky’s case who is clearly extremely talented and I would love to meet him and collaborate, just to annoy everyone!